Arizona dissolves into yellow plains as we push through New Mexico and into Texas, stopping in El Paso just long enough for a meal. We’re never more than 30 miles from the border, and our hours have caught a cadence of gas stations, hole-in-the-wall food joints, and roadside motels. 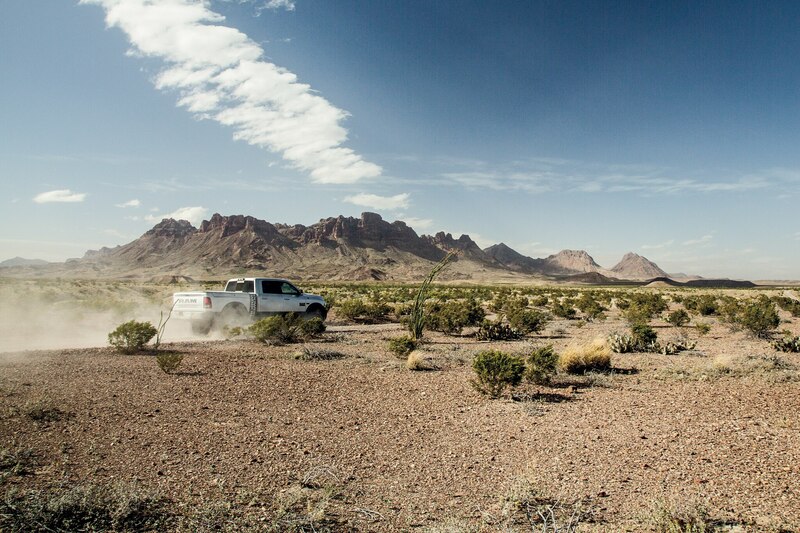 The Ram Power Wagon shows the marks of our miles, dusty and pinstriped, splattered with a thousand desert bugs. 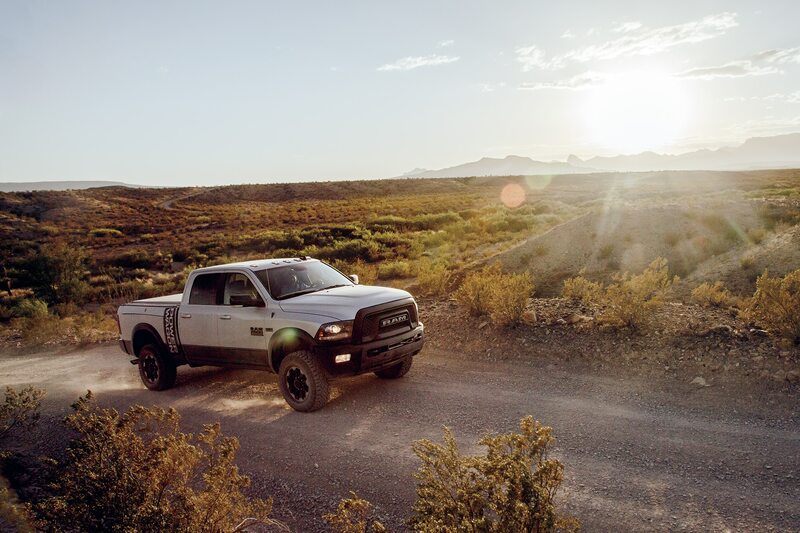 The perfect wanderer, inside and out, its plush leather seats comfortable, its bare vinyl floors up to the task of enduring the sand and grit we track in. We eat and aim for Big Bend National Park, some eight hours from Texas’ western-most city. It’s a long ride down I-10. Another reminder of how gargantuan our country is, of the impossible scope of us. The daylight left us hours ago by the time we find Highway 90, and the sky’s spattered from horizon to horizon with stars, so many that my familiar constellations are lost in the wash. We drive for long hours, nothing in our high beams but two yellow lines and a few hundred hare. The morning shows us what we were missing by staring at the stars. The landscape has changed. 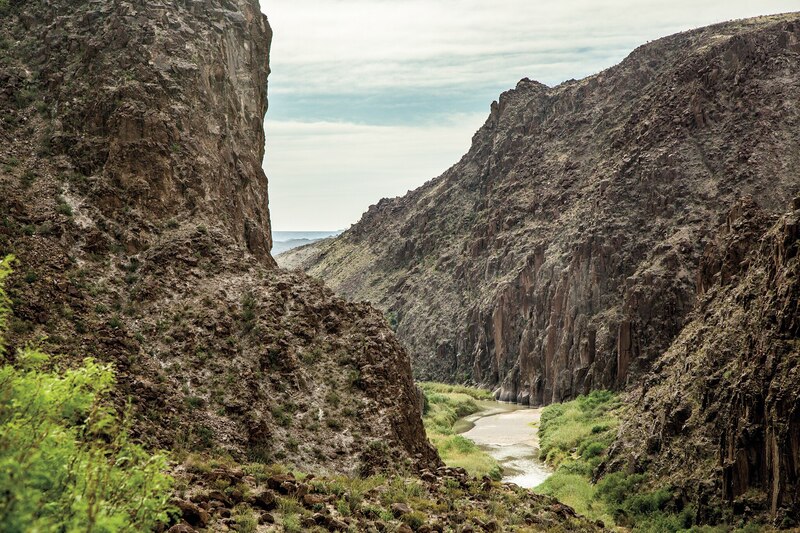 Just outside of Presidio, the Rio Grande is a green and living ribbon twisting its way through the Texan bedrock. Life clings to the banks. You smell it long before you see the river proper—the delicious aroma of water and the sweet perfume of wild and thriving desert trees. Mesquite and juniper hang on the cool morning air and come singing through our open windows. The land goes wild, the river slicing through deep gorges, taking the border with it. 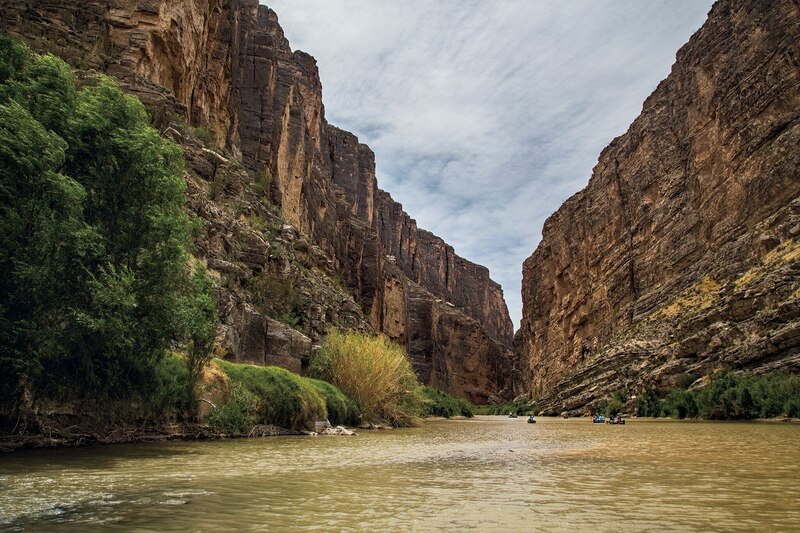 At Santa Elena Canyon, the rock faces that separate the U.S. from Mexico are 1,500 feet high. 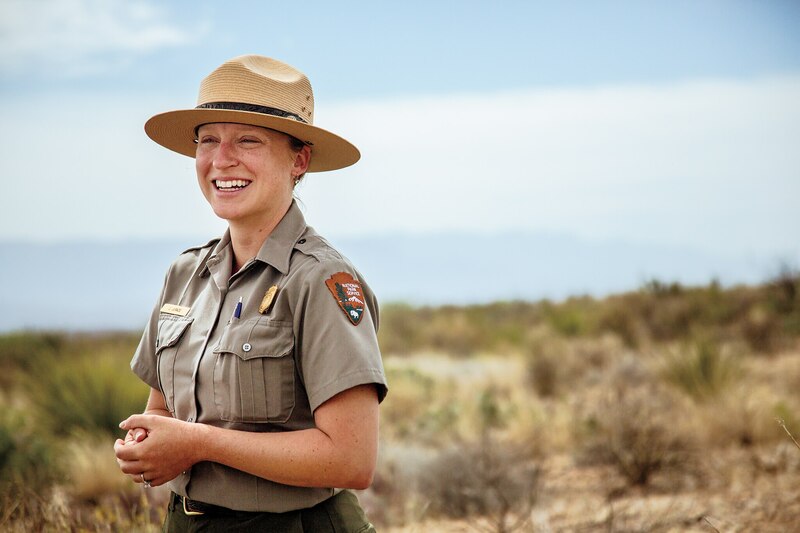 Jennette Jurado has been a park ranger at Big Bend for 11 years, and though she’s a Michigan native, it’s clear from the way her voice swells when she talks about the place that she thinks of this as home. Her eyes are bright and smiling as she tells us that there are two parks here. Between Big Bend and Rio Grande Wild and Scenic River, the park service manages 245 miles of the international border. Both are part of the largest Border Patrol sector in the South, one that covers some 510 miles of border and blankets 135,000 square miles, including 118 counties in both Texas and Oklahoma. Despite its size, it’s the quiet-est sector for illegal alien crossings. In 2016, the area saw 6,366 apprehensions, less than half of the next busiest sector, Yuma. Agents apprehended a total of 415,816 individuals attempting to enter the country illegally last year, and though that’s a staggering figure, the agency says the number is a long way from the high-traffic era. Between 1980 and 2008, apprehensions averaged 1.1 million individuals per year. Jurado says that in her 11 years at the park, she’s never personally seen or interacted with anyone trying to cross from Mexico into the U.S. through Big Bend. When I ask if she feels safe here, she offers a smile and laughs. She tells us she routinely heads out to hike in the park alone and has never had a problem. The biggest danger is the environment, she says, because hikers routinely underestimate just how much water they need. There is no physical barrier between the two countries here. The land serves that purpose, and when we look across the Rio Grande, all we see is another few hundred miles of empty desert, the back door to Mexico’s Cañon de Santa Elena national park. The cliffs of Santa Elena Canyon split the United States and Mexico at Big Bend. They’re breathtaking, taller than the Empire State Building, flagpole and all. She has a hard time keeping the pride out of her voice. And later as we wander the 50-mile dirt road that hugs the Rio Grande, we understand why. This is a place to be proud of. The Chisos Mountains are stunning, rising 2,000 feet up from the desert plain like a fortress on our horizon. Ocotillo plants wave their alien, spiny arms at the sun as we pass. We see horses, wild or near to it, their flanks shining amber in the sunlight. Even in early spring, it is impossibly hot. Sweat wells and evaporates on your skin the second you step outside, leaving a thin and coarse trail of salt behind. There is no manmade barrier between the two countries here. The land serves that purpose. When we look across the Rio Grande, all we see is another few hundred miles of empty desert, the back door to Mexico’s Cañon de Santa Elena national park. The sun is setting by the time we make the eastern end of Big Bend, the sky dimming to navy as the light fades. Eager stars flicker behind those old mountains, and a cool wind picks up. After the bake of the day it’s almost cold, and we find ourselves grabbing our jackets as we point the truck toward Laredo. When we arrive the next day, we find an entire economy hanging on the border. The Laredo Port of Entry is the busiest land port in the Western Hemisphere. 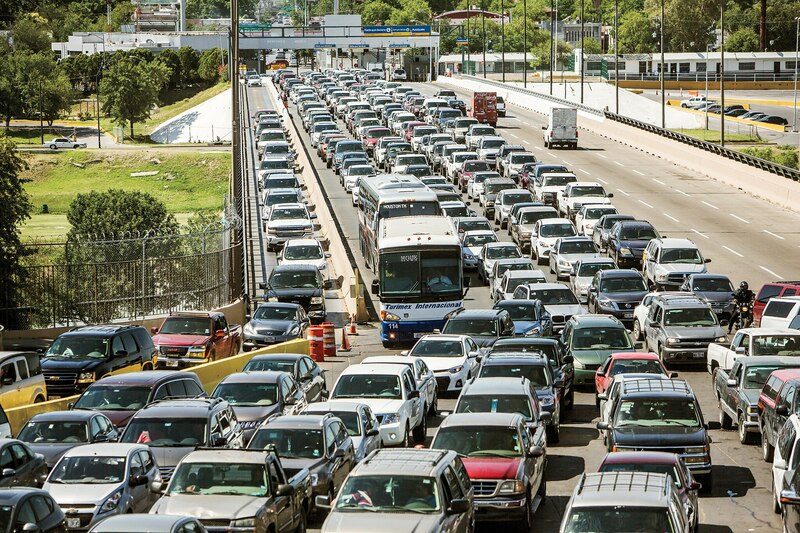 Forty percent of America’s trade with Mexico comes across its bridges. We meet with Port Director Gregory Alvarez and Assistant Port Director Alberto Flores on a busy morning. Flores is a Laredo native. He speaks quickly, his dark brown eyes ready with a sharp and mischievous joke if the moment presents itself. Alvarez is tall but soft spoken, his words considered and precise. He pronounces the Spanish names of towns to the south with a fluent flourish. He’s been port director here since late 2015. 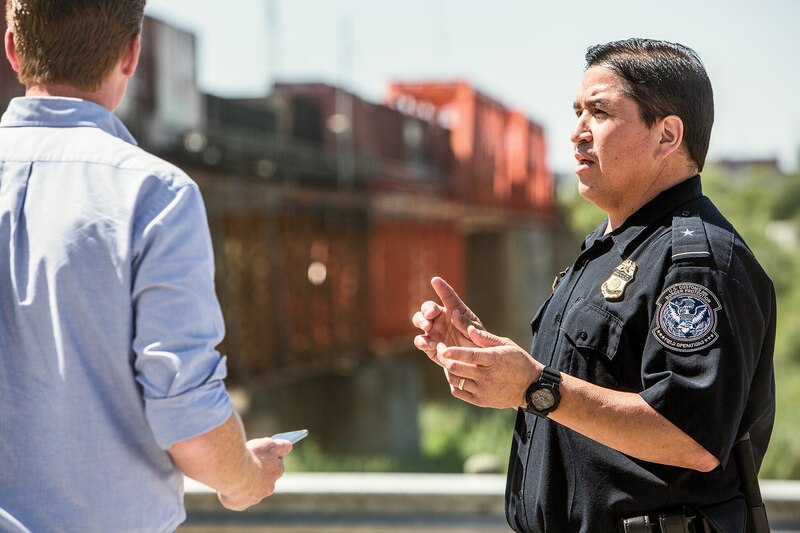 The port’s activity forces Border Patrol to walk a hard line between border security and trade facilitation. 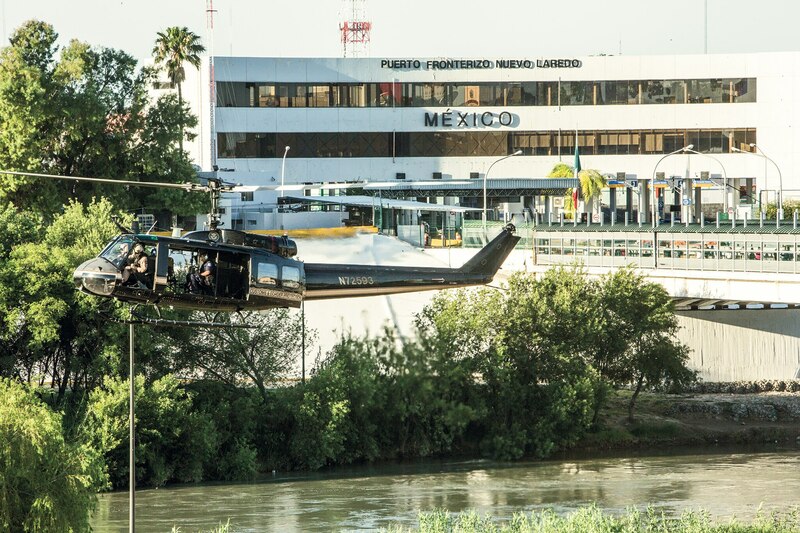 A Customs and Border Protection helicopter runs a drill outside our hotel in Laredo, Texas. Alvarez isn’t shy about the drug traffic that continues to come across the border at ports of entry. He says 1,000 pounds is pretty average for a marijuana seizure. Local news reports are full of headlines about what the Port of Laredo has seized in the past year: $800,000 worth of heroin in March and $5.6 million in cocaine in February. Alvarez is proud of the work his agents are doing, but he’s not naive. 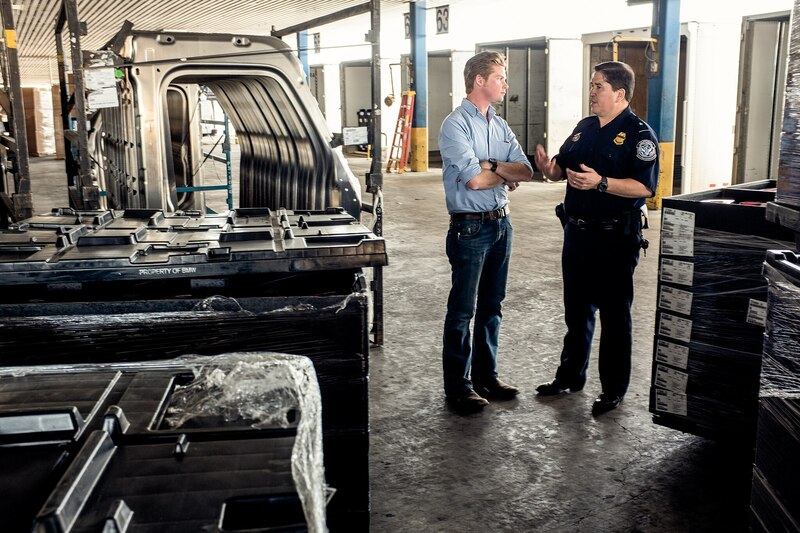 Agents will inspect auto parts on their way north from factories in Mexico. I ask if Alvarez cautions his agents about crossing the border. There were restrictions in 2007 and 2008 but not now, he says. Many of his agents have family on the southern side of the border and regularly travel to Mexico to visit. Alvarez says he knows the violence spun out of control with the cartels, and when it did it spurred a massive response from American law enforcement that continues to this day. 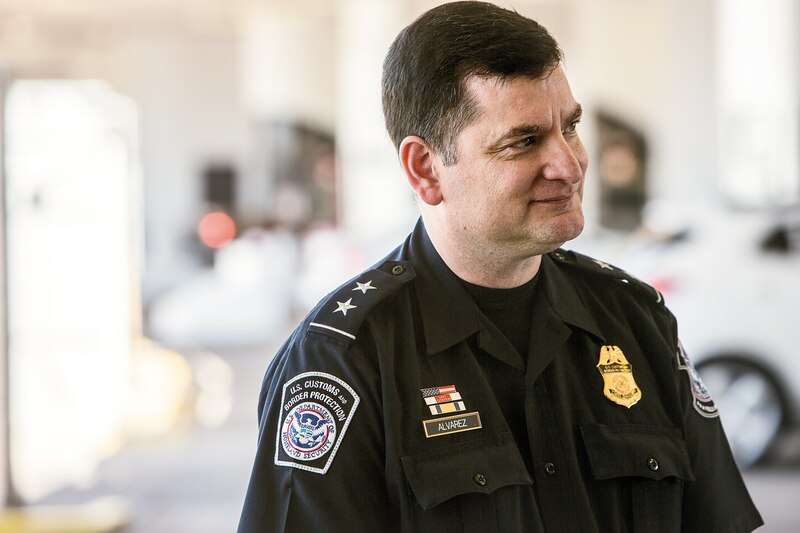 Customs and Border Protection is now the largest, most well-funded law enforcement agency in the country with an annual budget of more than $13.56 billion, and it enjoys a breadth of function unlike any other organization in the U.S. government, with oversight of 44 other agencies. That budget has afforded the Port of Laredo some impressive tools. Flores takes us on a tour of the facility, pointing out the various enforcement layers, from cameras focused on license plates and faces to the massive yellow radiation detectors. Every train car coming into the U.S. gets an X-ray scan. The imaging is impossibly detailed. You can count individual ceramic tiles and pallets hidden behind the sheet steel of a boxcar. You can count the lug nuts on pickups headed north from sister plants in Mexico. And you can see contraband. Bales of marijuana hidden in lead-lined crates. People lying in pickup beds. Later, at a similar scanner for semis, we beg to scan the Ram. The agents say no. “We’d hate to find something you didn’t know was there,” the agent manning the display says, his deadpan delivery betrayed by the smile that leaps to his lips. North Korea sails cargo ships off the coast of California with intercontinental ballistic missiles hidden below deck, and China is stockpiling weapons in Mexico. So says Texas resident Rusty Monsees. After the miles we’ve covered, Brownsville shows up quickly. The land quits being a desert, trading the brown plains for flat, humid Gulf marshlands. That’s where we meet Rusty Monsees. He’s a man who can’t decide where his tall tale ends and reality begins. He’s 69, his face and scalp a patchwork of skin cancer craters. Gifts from a lifetime under the Texan sun. He smokes like the world’s running out of Pall Mall menthols. Says his family has owned a spit of land up against the border here since the 1940s. Monsees has had a clear view of Border Patrol’s efforts over the years. It’s a strange sight. 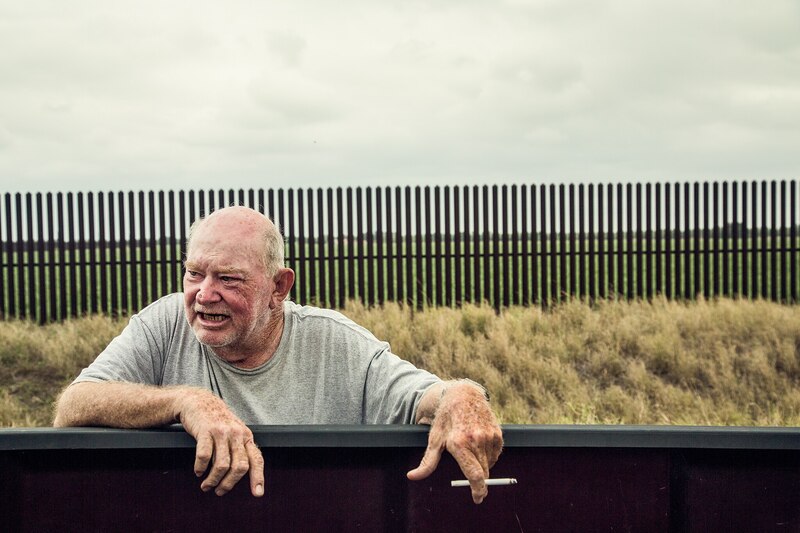 The border here spends much of its time on private land, well beyond the levee that protects the town from storm surges, upon which the border fence rests. In some places, that’s more than a mile from the international line. 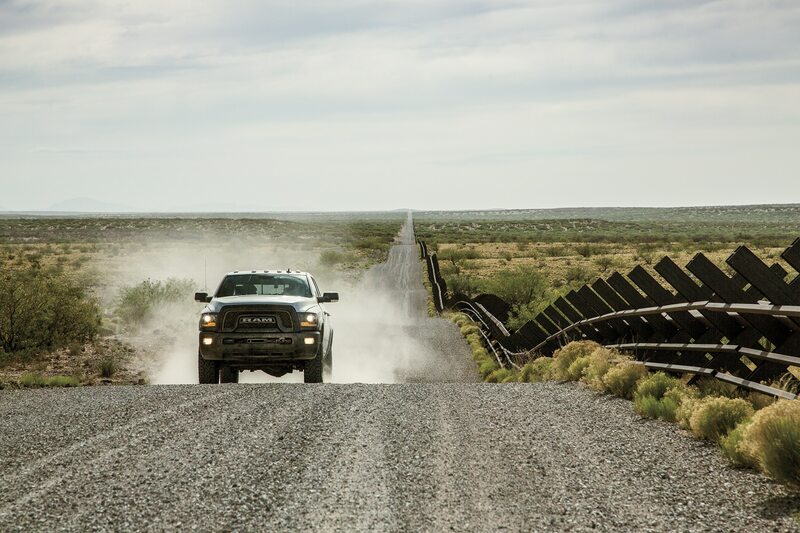 There are gaps where people and vehicles come and go through the fence, and though a Border Patrol agent watches the traffic from his vehicle, he doesn’t stop or question anyone while we’re there. It’s easy to understand Monsees’ frustration. 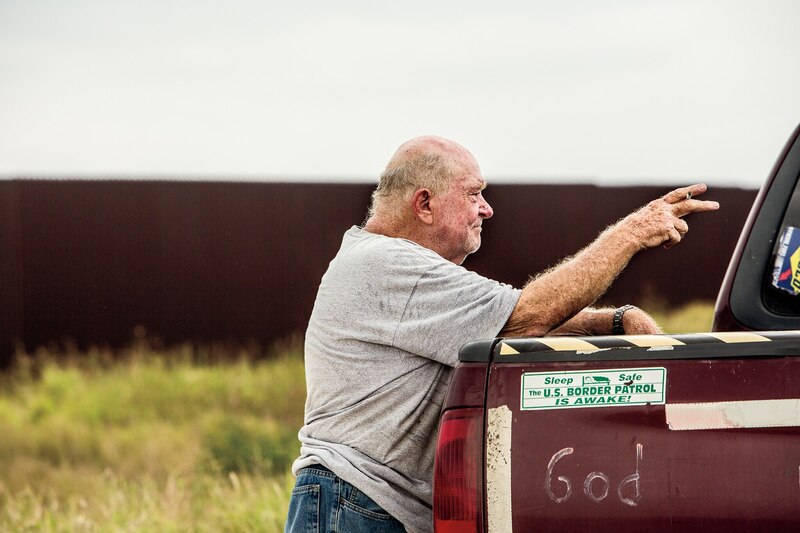 There’s no way that the Border Patrol can get down here and adequately enforce it,” he says. It’s harder to follow his logic. It wanders in and out of conspiracy theories. He tells us he’s seen uniformed ISIS soldiers streaming across the border, complete with AK-47s and rocket-propelled grenades. He says he’s buried 150 of his own dogs over the years, all killed by Mexican coyotes moving people and drugs across the border. He says North Korea sails cargo ships off the coast of California with intercontinental ballistic missiles hidden below deck and that China is stockpiling weapons in Mexico. He says he once saw a U-Haul in Matamoros packed with the decaying corpses of children slain by a cartel for their organs. Living on the Edge: Rusty Monsees hosted a militia camp on his property a few years back. The group disbanded, and at least two of “Rusty’s Rangers” wound up in federal prison over gun offenses. He moves so fast, jumping from apparent fallacy to fallacy, it’s impossible to mine the truth from the slurry of lies that churn from his lips. It would be tempting to write him off entirely, but he thoroughly believes the things he’s afraid of. He believes them even if there’s nothing there, and he’s not some insane panhandler. He’s a land owner. A voter. 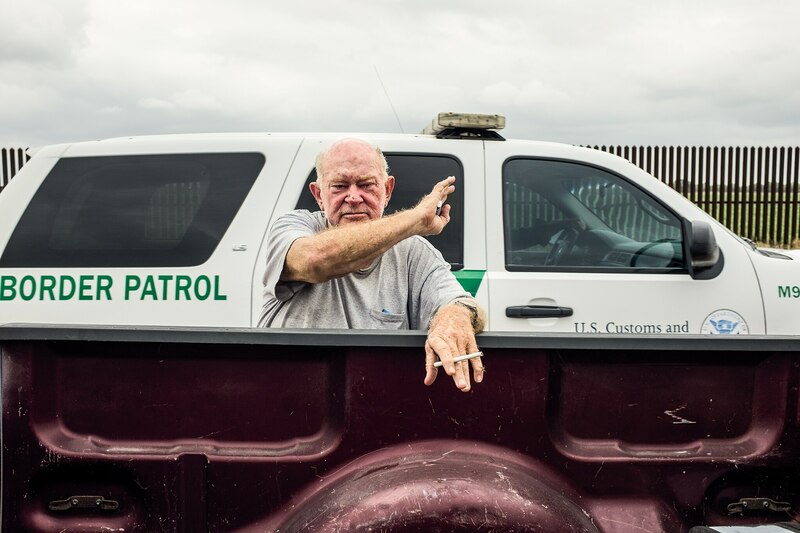 He says something that rings clear and true just as a Border Patrol Chevy Tahoe rattles past us, stirring up a haze of grit from the dry levee road. Monsees lifts a hand in greeting. 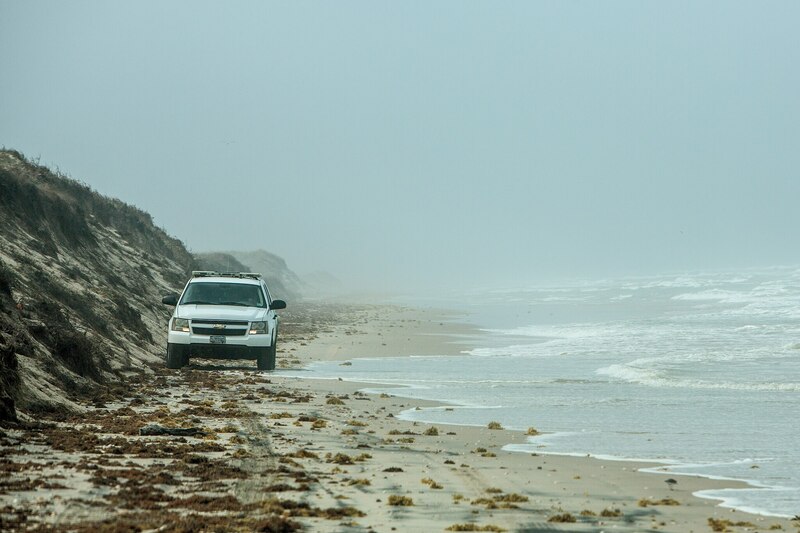 A Border Patrol Chevy Tahoe inches its way down the beach in Las Palomas Wildlife Area outside Brownsville, Texas. Last year, the U.S. sent $320 million in aid to Mexico, most of it geared toward law enforcement and counter-narcotics initiatives. This, for a country in which just 34 percent of its citizens have completed upper secondary education. For a nation with a life expectancy five years shorter than the Organization for Economic Cooperation and Development’s worldwide average. For a place that boasts an average monthly household income of $843. For the neighbors we share our southern fence with. It’s strange. We’re happy to spend billions building a better mop to sop up the tide of individuals and narcotics spilling over our border, but we’re reluctant to help Mexico pull itself out of the economic gutter that funnels people and drugs to our door. The U.S. needs a strong and prosperous Mexico, one humming with jobs and opportunity. Security. Without it, as a nation, we’ll be facing the fence for the rest of our lives. This isn’t a radical concept. Mexican President Enrique Peña Nieto said as much when he ran for office five years ago in a piece outlining ways for the country to end its drug violence. But it’s impractical to expect Mexico to solve its problems alone when so many of them stem from America’s appetite for narcotics. So much of the border and how we respond to it hinges on perception. Safe or dangerous. Beautiful or terrifying. Kind or cruel. It feels like there is no single truth down here. It moves and shifts with each and every person you speak to, more fluid than the sand of the Algodones Dunes or the muddy and wandering banks of the Rio Grande. Every map of it is an approximation. A suggestion of where reality might lie, somewhere between our Border Patrol agent’s bandit-riddled hills and Jurado’s quiet and wonderful desert plains. Between resident Monsees’ fear and park ranger Jurado’s love. We grab a six-pack on our way out of town. Catch low tide and point the truck’s proud snout down the beach to the end of America. The Gulf smells so different from the Pacific. It reminds me of the Atlantic of my youth, all sand reeds and salt. There’s no wall here. Just a wide and easy estuary between the two nations. The breakers are low, and two fisherman wade out in the cold water from the Mexican side and begin casting a net. There’s nowhere else to go. 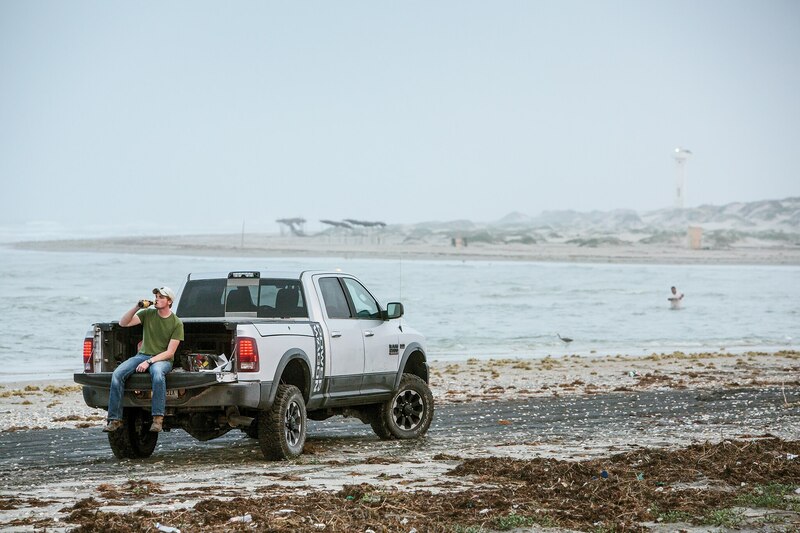 Nothing else to do but crack a beer, drop a tailgate, and watch the waves wash the day out.